While my childhood was filled with a wide variety of Queen songs from We Will Rock You to Bicycle Race, I connected most with the band's work through their soundtrack of the 1980 Flash Gordon movie. I do not know how many times that I watched that on HBO or video tape back in the day, but its campiness surely connected with me. Therefore, I selected the Queen song "Flash's Theme" and dubbed this one after one of the lyrics describing Flash Gordon -- namely King of the Impossible. One of the scenes from the movie that I immediately recalled was the wood beast scene on Arboria, and I tried to channel its woodsy and exotic feel. When I honed in on cachaça [as the base spirit], I was inspired by Ben Sandrof’s Esmeralda at Drink which utilized a hint of Scotch smokiness to complement the cachaça base. 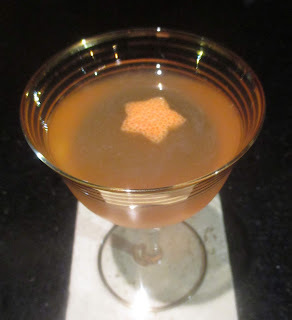 Instead of Scotch, I went with a smoked tea syrup, and the rest fell into place with a touch of banana for exoticism and a dash of Peychaud’s Bitters which work great with the Amburana-aged Seleta Gold Cachaça that I utilized (as I discovered in making a Cachaça Sazerac one night). Once the recipe was finalized, the King of the Impossible welcomed the nose with grapefruit, banana, and cachaça funk aromas. Next, lime and tropical fruitiness on the sip gave way to funky cachaça, smoke, banana, and black tea flavors with lingering banana and a hint of anise on the finish. Please go see the other Queen cocktail entries HERE.